← Photosensitive epilepsy = Purple Day epilepsy? The Zeiss F133 lenses are a deep cobalt blue. They filter out a lot of light, and block out the color red, the most seizure-provoking color. They absolutely do prevent seizures while Alice watches TV! They also prevent the seizures that happen when she reads uninterrupted for very long periods. And they’re handy for unexpected events out in the community—emergency lights, flash photography, and flickering fluorescent bulbs. Alice can feel that her eyes are under less stress as soon as she puts the glasses on. I guess it’s similar to feeling less uncomfortable when putting on regular sunglasses in bright sunlight. No hard data, but we suspect that even with the lenses, there is still some effect on her brain that sneaks through. We can’t say for sure, but we have a hunch that she has more unprovoked seizures in the day or days after watching TV. So we currently limit TV to a couple of half-hour sessions per day. 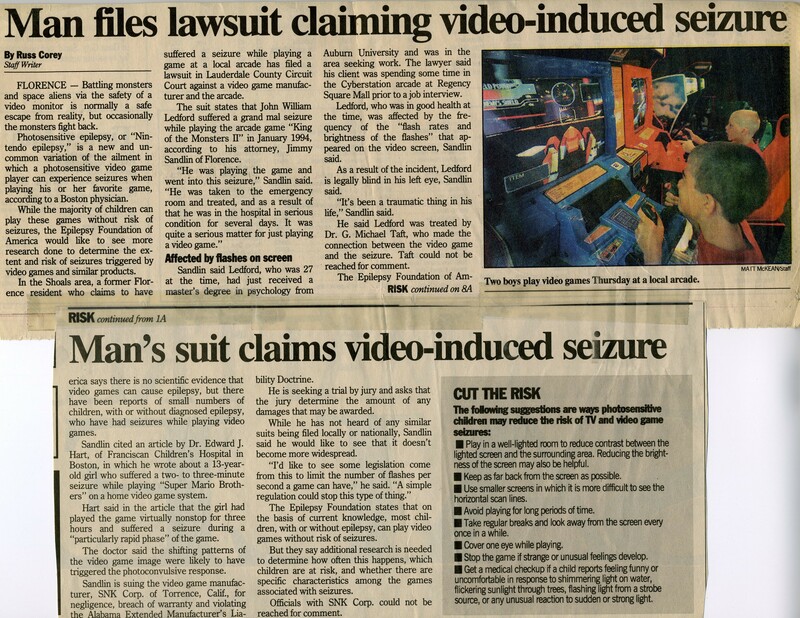 I can’t report on the lenses’ effectiveness for preventing seizures from video games because we aren’t going there. Alice cannot be around video games, period, because she very quickly becomes intensely addicted. If left unsupervised with a computer, she will find a game site. If left alone to play video games with blue glasses on, she invariably removes the glasses when no one is around. There is something about that pre-seizure trance that her brain finds irresistible, even though her mind knows she’ll regret bringing on a seizure. The world looks kind of eerie all in the dim blue light that gets through the lenses. You can’t really discern color very well except for yellow, blue, and green. As expected, clip-ons are hard to keep track of when they’re not attached. (This is especially true for people with the attention and memory issues that often are associated with seizures). I just ordered another pair! If you get prescription glasses made from the Zeiss lenses, you’ll be switching off with your non-tinted regular prescription glasses–one pair on top of your head or hanging around your neck or at large and at risk of getting lost. Z1 is the name of a filtering lens, made by Zeiss in Germany, that blocks out 80 percent of light. (I’ve previously said they are cross-polarized, which is incorrect.) These are the lenses used in the Capovilla studies. F133 refers to the particular shade of blue that was found in clinical tests to be most effective for photosensitive patients. Zeiss does the tinting. It’s a lens that was already commercially available in Italy, where the study was done. Researchers have looked at some other lenses as well, and I hope to learn more about those and pass along what I find out. Given how effective the Zeiss lenses are, though, there hasn’t been a lot of other investigation. Like everything else having to do with seizures, what works for one person may not help another. Before investing in these you might want to just try polarized sunglasses to see how helpful those are. For some people that may be good enough protection. If you don’t wear prescription glasses, order blank F133 lenses and pick out a pair of eyeglass frames from an optician who will fit them for you. The optician can cut and insert the non-prescription F133 lenses when they arrive. Plain lenses, for clip-ons: 99 Euros (as of this writing, approx. $130) plus shipping and insurance. Fee to cut blank lenses to fit into (most) sunglasses frames that you send: 20 Euros (as of this writing, approx. $26). Send Antonio your eye doctor’s prescription and a pair of frames. Antonio will make tinted prescription glasses for you. Wear them as needed as you would wear any prescription sunglasses. Send him your prescription and provide the designer name, color, and model number of a pair of frames you’ve chosen from your optician, and purchase the frames and lenses together from Antonio. He’ll send the assembled glasses, and this way you don’t need to ship him the frames first. Cost: Varies according to the prescription, whether you need bifocals, etc. These clip-ons attach magnetically to your eyeglasses at the top. Tiny screws visible on the lower half of the frame allow standard shades to be replaced with the Zeiss lens. Order blank F133 lenses that your local optician can insert into a clip-on frame that attaches magnetically or hooks on to to your prescription glasses. Note that because Z1 F133 lenses are 2mm thick, most clip-on sunglasses frames cannot accommodate them. Typical custom clip-ons that match your eyeglass frame are made with a thin plastic lens that can’t be replaced without breaking either the lens or the frame. Ask your optician about clip-ons that have a tiny screw that allows the Zeiss lens to be inserted. We ended up buying an EasyTwist frame for the prescription glasses, which comes with a matching magnetic clip-on like the dark green one shown above. Our optician replaced the standard green shade with the F133. The next time Alice needs new prescription lenses, we can still use the same clip-ons. Please send in comments to share your experience! I’ve learned a lot from some of you (especially L.H.) who also have been tracking these down. Have you been able to order the lenses from an optician closer to where you live? How well do the lenses work? There are 2 sources I’ve recently heard about in North America. I believe they both have contacts with Canadian Zeiss representatives. Both optometrists can order the lenses and mail them to you. 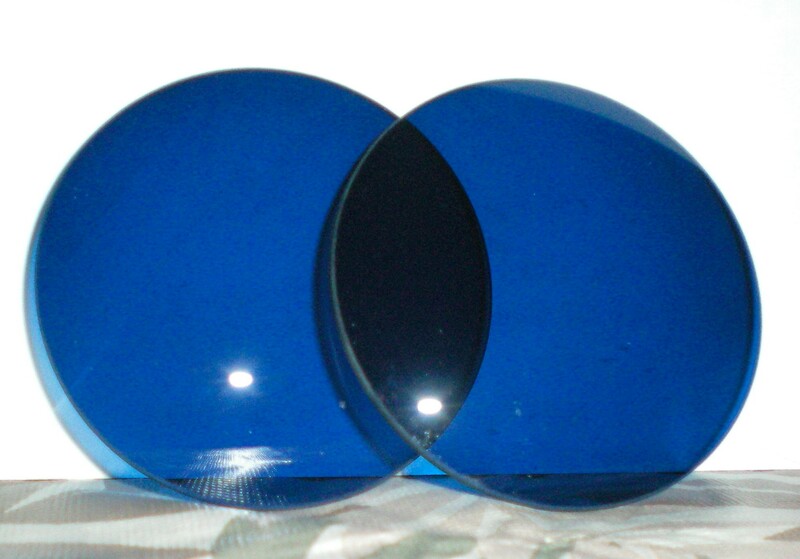 The clinic provides the lenses for $250 (March 2012 price). You can order them as uncut lenses or, with a prescription and frame (or frame information), make up a pair of prescription glasses. In December 2013 Larra H. reports that you can also order them in a fit-over, standalone frame that covers the field of view more thoroughly. Cost for the Zeiss lenses has apparently dropped, so the plain Zeiss lenses in a fit-over frame is now down to $165. My daughter has just been diagnosed with sunflower syndrome, a type of photosensitivity epilepsy, self induced generally outdoors in the sun/glare or certain bright lights like heat lights. I have been researching what type of polarised lenses would help her alleviate the impulse to strobe the light with her hands, and came upon your site. 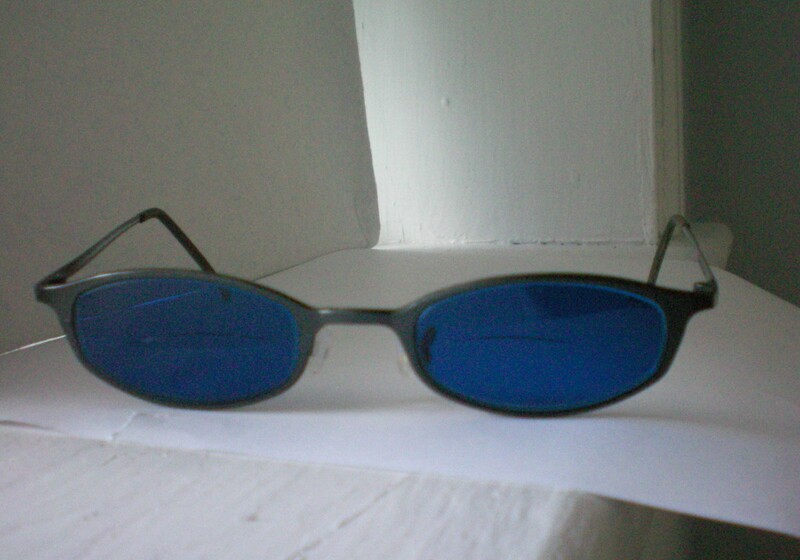 We use polarised glasses (greylense) but they don’t do much if anything – do you think these blue lenses would help ? i will be trying blue sunglasses and then possibly these – can she wear them inside so she doesn’t have to put on or off as she leaves classroom. The most effective lenses for most people are the blue ones. If you buy the (less expensive than Zeiss) type that are tinted by an optician, they aren’t as dark as the Zeiss lenses, so they are easier to wear inside. I hope she’ll keep the lenses on–I have heard that sunflower syndrome can be challenging to treat. It’s definitely worth trying tinted blue ones using the Deep Blue Zee tint. Good luck, and if you have a moment, let me know how it works out. Thanks so much for getting back to me. I will give the other blue tint a go and keep you posted. thanks for this opportunity to ask question. just wanted to ask, you answered my previous query on sunflower syndrome. These Zeiss lenses or tinting – what wavelength do they block out? Is it red , IR ? The polarised lenses tried do not work. Yesterday we tried the Zeiss F133 lenses but as it was just one sample lense I am unsure if it actually worked. We held it to her eye and walked around to see if she still reacted, nothing happened but am unsure as to whether it was that she was holding the lenses and that slight occupation helped her not react. As in the past if both hands are occupied we have had limited success at holding the reactions off. any more info you to help us understand what wavelength is creating this reaction is much appreciated. We have these lenses at Emerald Eyes Optical in Sea Girt, New Jersey. We have samples of the Zeiss Z1 F133 and The BPI Deep Blue Zee along with a variety of other therapeutic lenses. http://www.emeraldeyes.com, https://www.facebook.com/emeraldeyes.inc/ 732-974-3937. Please see my response to Querra re what exactly these glasses are for. Outside on a sunny day these glasses don’t suppress seizures. They eliminate certain wavelengths that can trigger seizures when the wearer sees flickering or flashing light, like fireworks or strobe lights or a bad fluorescent bulb–or certain video games. Do these lenses help with rosacea breakouts? It seems possible to me because photosensitivity is a factor in this skin condition. Has anyone tried them for this purpose? Hi. When referring to the skin there’s a very different meaning for photosensitivity. In photosensitive epilepsy, the brain’s electrical rhythms are thrown off by flashing lights (not necessarily the sun) and patterns, which results in a seizure. Blue lenses protect the brain’s visual cortex from the wavelengths that are most seizure-provoking. Those lenses look very similar to the ones that Hillary Clinton is wearing. Is it possible that that’s her health problem? They do look similar in the pictures. However, I wouldn’t assume that she was wearing blue lenses because of seizures. The blue lenses that I’ve written about protect against a specific type of seizure triggered by flashing light. Flash is a rapid alternating between bright light and darkness, which is much more likely at night or indoors, and the pictures you’re referring to were taken outside in broad daylight. Are Z1 lenses for outdoors generally because they are so dark? My daughter’s photosensitivity has to do with walking between rooms with relatively different lighting (different intensities, possibly different bulbs) as well as the intensity of sunlight. Since Z1 blocks red wave lengths, and “blue tech lenses” block blue, could both ends of the spectrum be put into one lens or be combined somehow? Any thoughts on this or experience or research with Blue Tech lenses as it relates to epilepsy? I don’t know if it’s possible to create a tint/lens designed to filter out both red and blue. It could be that that wouldn’t leave very much to get through…but I’m not an optics expert. I am not aware of blue tech lenses being applied to epilepsy. My understanding of the Z1 lens is that it’s designed to filter out most of the light. Researchers, knowing that red wave lengths are particularly provocative, took that lens and tinted it to the cobalt blue to combine the effectiveness of the blue tint with the lessening of overall brightness. But it’s not necessary to use that lens to block the red–you can use any lens that is tinted to that color blue. My daughter has regular lenses that were tinted that color as well as the Z1 blue ones. The regular lenses let in a lot more light but are still effective in blocking the problem red. If your daughter doesn’t need the light reduction so much when she’s indoors, she might prefer the optician-tinted ones that I wrote about here. My doctor has recommended these lenses for me as I have photo sensitivity seizures. I currently have a drivers license; does anyone use these lenses to drive? Can you see stop lights, especially red? See sirens? Stop signs? Thank you for any information. Hello, Yes Zeiss option is a wonderful lens and effective. We have developed two different contact lenses with this feature that can be worn all day. So far one patient has been seizure free for 2 years and 2 others for 6 months. Available in Rigid Gas Permeable and Soft daily wear. This lens also appears to eliminate resting EEG activity. Has been extremely effective. For information please contact Dr. Steven Cantrell scantrellod@gmail.com or call 314 961-7511. Our patients have been thrilled and one is off all medication with her Neurologists blessing. Steven Cantrell, O.D. I have heard it blocks out about 80% of light. Is this true? Would it be possible to just eliminate the red light (supposedly the colour that most causes photosensitive seizures) and all the other colours would be fine? Yes, the Z1 lens is designed to block out most of the light, and when tinted a certain color blue it also completely blocks the red spectrum. And yes, it is possible to just eliminate red wavelengths by tinting regular optical lenses with the exact shade of blue that researchers found was most effective when they tested the Z1. Opticians can use a tint that was developed for exactly this purpose–to provide photosensitivity protection without the need for the more expensive and hard to obtain tinted Z1. Information on what to ask your optician for is here. The Zeiss Cobalt Blue lens appears to be working to prevent Photo Sensitive Seizures. I am an Optometrist in St. Louis and recently fit one of my patients with Rigid Gas Permeable contact lenses custom tinted with the deep blue filter. She has been wearing these contact lenses now for 10 weeks and reports no photo sensitive episodes. She can shop again in stores that caused trouble and flickering sunlight through the trees no longer triggers a problem. This is very new and appears to have promise. Thanks for sharing this. It makes perfect sense that tinting the contact lenses this same color would work but I never actually heard of it being done. Zeiss Z1 lenses block out a great deal of total light (not just the red end of the spectrum) which could be a problem in a contact lens…but we found the same blue shade added by an optometrist as a tint to eyeglass lenses were not nearly as “room darkening” and just as effective. Hi everybody…I have a 12 year old with seizures. I have found that certain lighting,video games, TV, too much eye stimulation will affect him. Any latest updates on these sunglasses? I want to order some but was looking for recent posts. Thank you for your time. Try the Facebook page called photosensitive epilepsy, where there’s more back and forth posting of info. Well, we had the lenses tested at our latest trip to UCLA. The head of pediatric neurology, Dr. Ramon Sankar, asked if we’d let him do some research. The EEG showed no change with or without the glasses. HOWEVER, because of my daughters medicine cocktail she appears to no longer have the photosensitivity. HOWEVER, now that school has started, she is much more comfortable wearing the glasses. She can read better and concentrate more with them on. Next year we will whine her off the meds and do an EEG again. hi, do you know if it is possible to have contact lenses made rather then glasses and if they would work? thanks! Good question. Now that there’s an equally effective tint available for glasses made by manufacturers other than Zeiss (see https://videogameseizures.wordpress.com/2012/04/27/seizure-protection-in-a-bottle/), it’s conceivable that the tint could be applied to contact lenses. Ask your optician if this would work–and please keep us posted. they had to order away to Germany for the blue lenses then were able to apply my prescription and cut them to fit my frames. I suffer from flourescent lighting and flat screen monitors at work. Just need coated glasses without correction. Can it be gotten? From where?